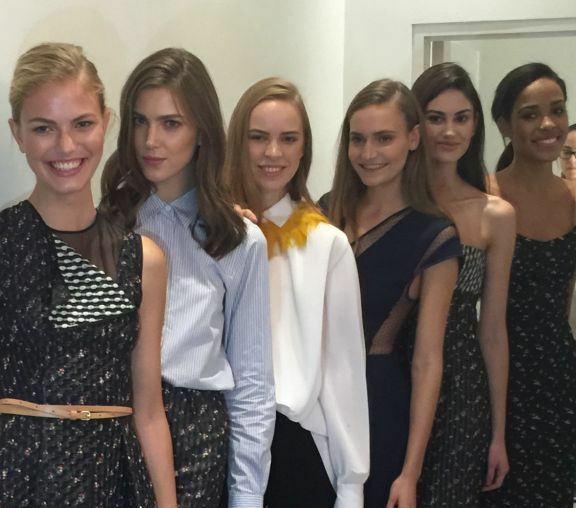 Models ready for the Victoria Beckham fashion event at Selfridges Exchange Square. Hair by Peter Marcus. Style Queen Victoria Beckham was in town last week to showcase her SS15 collections at Selfridges Exchange Square. Due to our new salon location at the city centre store, we were asked to style the hair for the exclusive fashion event! A team of models, specifically selected for the event, were given the Peter Marcus Selfridges salon treatment by our stylist James. He was charged with styling the girls according to the brief from the VB style team. The hair needed to compliment the outfits perfectly, however a common theme of loose hair worn down was selected for most of the models. The coveted fashion event on Wednesday 19th November saw Mrs Beckham host a private viewing for around 70 guests, including top fashion journalists, to discuss her new designs for SS15. Victoria Beckham RTW and Accessories, Victoria, Victoria Beckham and Victoria Beckham Denim are available at Selfridges Exchange Square and online at Selfridges.com. To book an appointment at the Peter Marcus Sefridges salon please call 0161 838 0513 or complete our online booking form.